If you are new to the health benefits of magnesium oil, the simplest and fastest way to know just how good you can feel is to get a magnesium oil massage. It doesn’t take a lot of magnesium oil for a massage, just about 1 fluid ounce (30 ml) for an adult or ½ fluid ounce (15 ml) for a child. Magnesium oil contains about 80,000 mg of elemental magnesium in a liter, so 1 fluid ounce delivers about 2400 mg of the mineral directly to the skin. How much skin is treated. The more of your skin that comes in contact with the oil, the more magnesium your body will absorb. How long the oil stays in contact with your skin. An hour-long massage with magnesium oil delivers a healthy dose of magnesium to both massager and massage-ee, a five minute massage followed by a quick shower, not so much. How concentrated the oil is when it is applied to your skin. If you dilute magnesium oil with water, less magnesium, of course, gets delivered to your body through your skin. What if you want to Luxuriate in a warm, therapeutic bath with magnesium oil? You’ll feel better if you use as little as 1 to 2 ounces (30 to 60 ml) of magnesium oil in the tub, staying in the bath at least half an hour. But if you want to make your bath as beneficial as bathing in the sea, that is, make your bath water as rich in magnesium as sea water, for which you will need to use about 8 ounces (1 cup/240 ml) of magnesium oil in the 5 gallons (20 liters) of water in your tub. Note: Be sure not to use soap or shampoo when you add magnesium oil to your bath. The detergents will precipitate the magnesium so that it cannot penetrate your skin. What if you wanted to make your bath as beneficial as bathing in the Dead Sea? The unique feature of Dead Sea water is that the salt it contains is mostly magnesium chloride, not sodium chloride (table salt), which is consistent with Pacific or Atlantic sea water. Every liter of Dead Sea water contains an astonishing 45,900 mg of magnesium. 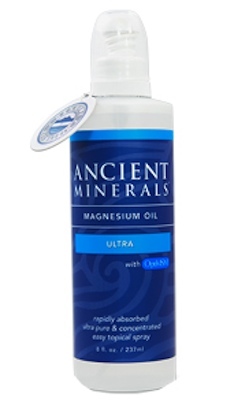 If you wanted to use magnesium oil to emulate bathing in the Dead Sea, you need nearly a gallon (4 liters) of magnesium oil. But, adding just one additional gallon to make a half-bath of magnesium water, quite frankly, gets a little expensive. Make your own magnesium oil in the tub with magnesium salts. Add from 2 to 6 pounds (1 to 3 kilos) of the salts to your bath every time, and luxuriate—without using soap or shampoo or any kind of scented product. You don’t necessarily have to use salts harvested from the Dead Sea to add magnesium to your bath; any product made from ancient mineral deposits will provide the same therapeutic dose of the mineral. One approach is to use mineral-enriched clay as a skin treatment. Use Dead Sea mud or any other mud pack that contains at least 4.5% magnesium on your face overnight or at least until it has been dry for two hours, washing away the residue with warm water and gentle soap. Or combine magnesium oil or magnesium salt therapy with oral magnesium supplements, preferably those containing magnesium chloride. And if you are using magnesium oil, you already have magnesium chloride. About 10 sprays into a glass of water or juice delivers a dose of magnesium your body can absorb use from the inside out, rather than from the outside in, to compliment the magnesium you get from skin application. If you have a condition like diabetic neuropathy, you need to get magnesium both ways, through your skin, and through the use of supplements. Some diabetics take more than 3 grams (3,000 mg) of magnesium supplements every day, and they take them in multiple forms, such as Maginex, Magonate, MagTab SR, and MgOxide taken at the same time, to make sure their bodies absorb the huge amount of the mineral needed for repletion. Important: You should not try this at home unless you know that you won’t suffer bowel urgency, and you need to be sure to drink enough fluids to avoid dehydration in case you develop diarrhea. But for most people, building up to taking 1,000 mg of oral magnesium supplements (starting slow to make sure you don’t cause digestive upset, and building up your dosage) in addition to magnesium oil massage and magnesium salt baths is the best way to correct and avoid deficiency. Many internet health gurus recommend using foot baths with magnesium salts to treat diabetic neuropathy of the feet. It is a better idea to use foot massage with magnesium oil for one very simple reason: Diabetic feet are usually calloused feet, and anything that softens the callus also leaves the skin vulnerable to infection. To get the maximum benefit of a foot soak, it is necessary to leave the feet in a pan of water that is roughly 1/3 magnesium oil for at least half an hour. That is long enough to cause wrinkling and loss of skin on the feet. Nature puts calluses on diabetic feet for a reason, and that is to prevent the formation of open wounds that can lead to infection—and in diabetics, infected feet often have to be amputated. On the other hand, rubbing the feet with magnesium oil will increase feeling and circulation, both of which reduce the risk of infection, both of which help existing wounds heal. There is no reason to get into a hurry to rinse off magnesium oil, but don’t put it on dry, flaky skin, which can also peel off and leave the tissue beneath it vulnerable to infection.